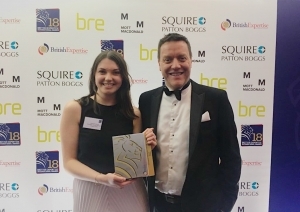 Trivandi are thrilled to have won the International SME Business of the Year Award at the British Expertise International Awards evening on 12th April 2018. The International SME Business of the Year category is focused on small and medium sized enterprises who are able to achieve remarkable success in the international arena. In the 5 years since the beginning of Trivandi, the focus has been on growing the business and working on global mega-events and major venue projects. Given the nature of Trivandi’s assignments and high-profile clients, we often have a huge influence on the perception, profile and reputation of a country or city. A large number of our projects are international and we focus on leaving behind a sustainable legacy within each country that we operate. This includes achieving a sustainable ‘hard’ legacy (new venues and infrastructure with a long term sustainable use strategy) but also a human legacy of knowledge and skills within our client teams and the local workforce. Trivandi have operated in 17 different countries in various continents, working very hard to establish new clients and develop new areas of business within new markets and territories. Each project is culturally unique and requires us to be flexible, to adapt our working style and show a sensitivity to the local environment and business culture. The Trivandi team are delighted to have been recognised for our achievements to date and in particular to have won such a prestigious award. It was great to be a part of a successful evening with other like-minded organisations.